Whether or not the misfortune has fallen upon you personally, you probably know someone in your direct circle of friends or family who has been the victim of card theft or fraud. That cold feeling of panic when you realise you’ve left your wallet at the bar, or that it fell out of your pocket while rushing to work, or the blind fear that someone may have actually pickpocketed you, or seemed to take note of your credit card numbers. Even more puzzling is the realisation that while making a payment online, somehow your transaction was not secure, and suddenly mysterious charges start showing up all over your accounts. The process that follows this desperately frustrating situation is quite enough to make a person consider physically stowing away one’s wealth altogether by burying it under a tree, dealing in a barter system, and doing away with the whole cracked financial system for good. After being battered by a hapless string of events, the hours it then takes to simply reach a bank employee on the phone to subsequently block your card, and then wait, not days, but weeks, in order to get a new card is enough to wake a person in the middle of the night in cold sweats for the sheer interminable inconvenience of it all. Well, whether you have been through it or not, the good news is that you may never have to go through this process ever again. The Wega Financial Payment Solution is (finally) here, to deliver the most robust and secure payment method on the market. This is somewhat in direct response to the plain facts: last year, gross fraud losses reached $22.80 billion, up 4.4% over 2015 according to the Nilson Report published in 2017. The report further points out that the U.S. alone accounted for $9.00 billion or 39.5% of the worldwide gross card fraud losses, and that issuers across the globe are going to have to start adhering to more robust authentication processes. Thus ushering in the age of 3D Secure 2.0, and the state-of-the-art technology created to satisfy the Payment Services Directive 2 or PSD2 banking law. 3D Secure 2.0 and PSD2 might sound like a whole lot of Star Wars-related babbling, but simply put, this collection of letters and numbers is the new face of banking as we know it. To keep it short, the PSD2 law requires two steps of authentication to be made for any online payment. This is different than what many of us online shoppers may have experienced before, as 3D Secure involves just one extra layer of security and authentication. This process takes place in the form of a code sent via SMS to your phone, or an extra password requirement as used in the Verified by Visa system. This helps to prevent a specific type of fraud in Card Not Present transactions, that is, any transactions taking place online, where it is not possible to verify if a person’s card is even physically present at the time of transaction. The PSD2 law requires the transaction to be proven with at least two categories of authentication out of three, as a regulatory technical standard for customer protection, or in plain English: to fully prove one’s identity. A press release from the European Commission issued in November 2017 outlines perfectly what constitutes a customer being protected while making electronic payments and transactions, and which elements are needed. For further light reading on this topic, see the European Commission press release in full. Wega has implemented this directly and wholeheartedly by utilising: What I Have (the card itself), What I Am (biometric authentication either using voice, fingerprint, or facial recognition), and What I Know (a pin code). If two out of three of these options are satisfied, you instantly have the most secure payment method on the market. And this is where Wega comes in, currently the only payment solution built to satisfy every possible standard of security, at your fingertips. The Wega Card and mobile application are both FIDO certified, strictly speaking, approved by the Fast Identity Online Alliance. FIDO has developed a strong protocol to dynamically exchange secret information at the time of transaction, requiring the strongest and most secure payment process in order to be certified. This fully responds to the PSD2 law, by approving technology which is able to exchange unique secret information in real time, to recognise the owner of the account. For those who might want to fully appreciate what this means, it takes a process of one full year to get certified with FIDO, and another two years to be certified for MasterCard, a process which Wega has already completed in impeccable timing before the PSD2 law and strong customer authentication becomes fully mandatory in the EU in September 2019. As the coup de grâce to finish off the dying breed that is our current digital payment system, Wega has developed a patented card with Acoustic technology: a cutting edge solution to prove the card is there by using a secret element issued by the card itself, a dynamic & different set of notes delivered by the press of a button on the card. The sound is unique every single time, to provide proof of approval of purchase, almost exactly like giving the card itself at the moment of purchase. Only your bank can recognise this, and the sound issued from your card is accepted through the Wega mobile app. Users will have the option to play their acoustic card, or choose between a biometric verification such as a fingerprint or facial recognition, and finish with a pin code. This also presents the option for a user to leave their card aside altogether and access their account, send money, block and unblock their card instantly, or create a single-use card with unique numbers, which is linked to your account to do a payment online, without revealing your primary card details. This could be helpful for those of us who simply can’t pass up that flight to Bali for only £200, even if it is from that slightly dodgy-looking third party website most likely being run by a 17-year old living in his mom’s basement. It was worth the shot, right? For those of you sitting on the edge of your seat and asking, but why would I want to go through extra steps if I just want to make a quick payment? Indeed, there is a reason why an online giant such as Amazon has developed a 1-click payment model, and that is the trade-off of convenience over security. Here we are dealing in risks, versus the impact on a customer’s journey. However, the good news is that the Wega Card is also contactless and works just like any other, for payments up to £30. Even better is that Wega offers their payment method with The Wearable Collection. The exact technology behind this is a company secret, but the options are limitless. Imagine being able to pay with a bracelet, watch, phone case, or even a ring. Some of you may be shuddering to imagine a huge clunky metallic looking object sitting on your finger, but all we can assure you is that it may not even be visible or recognisable to anyone else but you. Now the imagination may currently be reeling in all sorts of James Bond-esque scenarios, like casually tapping one’s pen on the card reader while watching jaws drop in awe and desperate admiration all around us – as the payment goes through instantly. However, we do somewhat insist on using an object a bit more permanently attached to one’s person. 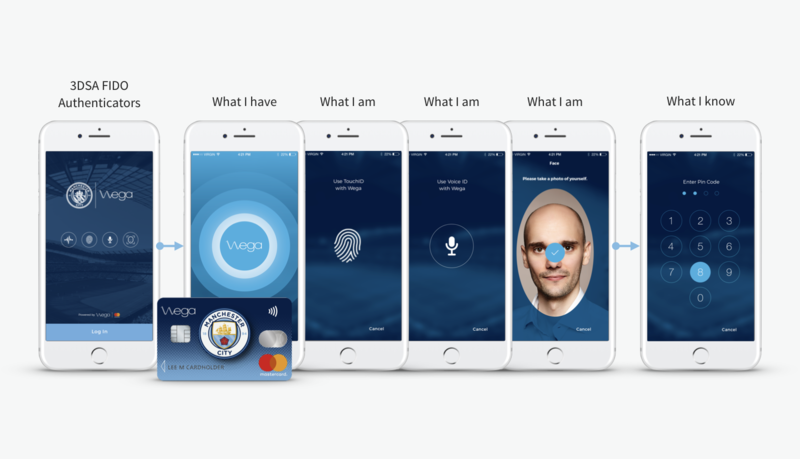 The first acoustic card will be available to the public in a co-branded product suite with Manchester City Football Club, reaching the market in January 2019. The innovation behind the Wega Payment Solution is a white-label technology, meaning it can be used in all forms and types of industry. For inquiries, please contact: malik.metouri@truxtuncapital.com.